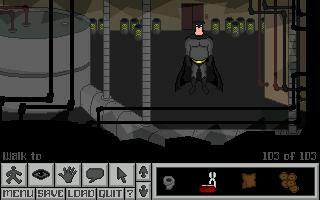 "The Adventures of Fatman is a fun, complete adventure game with a lot to offer fans of the genre as long as they are willing to look past the sometimes irritating voice-overs. Now that it is free there's even more reason to play it if you haven't yet!" The best thing about it is the humor, it's fantastic. Some puzzles felt unlogical and I had to use a walktrough to complete it. ...but I completed it and enjoyed the experience. Good work! This game was good, with some interesting gameplay. Though it unfortunately illustrates the disillusion of a lot of AGSers (commercial). Superb game! Absolutely superb! Nice graphics, nice storyline, absolutely amazing-really goes to show people just what AGS is truly capable of. Would you consider releasing the source code for people to look at, Ionias? Very nice. I recommend that game to all. Story and all were very good. I loved this game, the dialogue was interesting, humorous and I loved the story line. I think the creator put on his thinking cap with this one and did a great job! good game, bab website link no relly. I don't really like this game, it's not fun nor is it funny in the slightest. The visuals are lacking at best. The voice acting is bellow average. I give this game a 2/5. Geeze why was this game even TRIED to be sold. Wow, this is a fun games! Great music, and tricky but not impossible puzzles. The storyline is a little cheesy, but it develops into an exciting ending. One of my favorite games so far! Fun game - loved the humour!